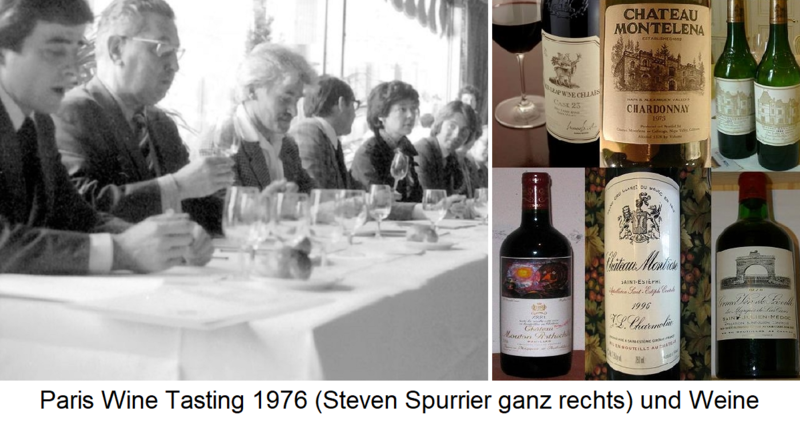 Already legendary wine tasting, at the initiative of the English wine dealer and experts in French wines Steven Spurrier (* 1941) on May 24, 1976 in Paris. Also known as the "Judgment of Paris", the event is memorable for several reasons. First, no expert had expected this surprising result, secondly there were worldwide discussions and significant effects in the international wine world, and third, because the competition in four stages over a period of thirty years was drawn. The competition has been repeated three times with the original wines; the third and fourth only with the reds. Finally, there was a book about it, the US journalist George M. Taber published in 2006, the approximately 350 -page work "Judgment of Paris: California vs.. France and the Historic 1976 Paris Tasting That Revolutionized Wine ". And last but not least, this material was even filmed in 2008 under the title "Bottle Shock" with the director Randall Miller; However, Spurrier was very dissatisfied because of what he thought was partly fictitious details. It was a competition of wines France and California each with ten red wines and white wines from well-known companies. Spurrier intended to improve the bad image of American wines, but of course still expected a clear victory for the French. The eleven jurors were well-known authorities beyond any doubt or experienced wine critic, That was Pierre Brejoux (Inspector General AOC), Michel Dovaz (Wine Institute of France), Claude Dubois-Millot (Sales Director Gault Millau ), Patricia Gallagher (Académie du Vin), Odette boat (1923-1982, publisher Revue du Vin de France), Raymond Oliver (restaurant Le Grand Vefour), Steven Spurrier, Pierre Tari ( Château Giscours ) Christian Vanneque (Sommelier), Aubert de Villaine ( Domaine de la Romanée-Conti ) and Jean-Claude Vrinat (restaurant Taillevent). Spurrier had also invited many reporters from well-known newspapers, but only the aforementioned George M. Taber from US Time Magazine was the only one to participate. Hardly anyone doubted the outcome - namely that the French wines would beat the Californian wines in the sense of "Everyone knows that French wines are basically better than Californian and always will be". The surprise was all the greater. When the result was announced, there was disbelief and embarrassing silence. Some jury members wanted the ballot back so they could rate it again. Likewise, some were denied signing the result. Judge Odette boat Spurrier even accused the manipulation and expressed in the episode very negative about the competition. In any case, the result shook the wine world and led to heated discussions. Especially France was shocked and did not want to accept the "shame". The devastating result was hushed up first and only three months later in the "Le Figaro" about the "laughable event that you can not take seriously" reports. A serious assessment was questioned, or the argument used that French wines just needed a long time of maturity to develop. But the fact is that at the latest from this time the wine from the United States taken seriously or at least judged differently. Because it meant a crucial turning point regarding the reputation of hitherto often derogatory as Coca-Cola wines designated products. It's no coincidence that just three years later the joint venture Opus One between the wine-growing legends Baron Philippe de Rothschild (1902-1988) and Robert Mondavi (1913-2008) was started. The winemaker Mike responsible for the winning estate Chateau Montelena Grgich gained a high level of publicity overnight. He founded it soon after in 1977 Napa Valley his own winery. Spurrier had been pragmatic in calculating the final numbers per wine. He simply added the individual numbers and divided the sums by nine (his own score and those of Patricia Gallagher were not taken into account). The two economists Orley Ashenfelter and Richard E. Quandt (both professors at Princeton University in New Jersey) again analyzed the result. Among other things, these took into account the intervals between the scores and thus came to a "statistically better and more valid" result. They calculated three groups, with the wines within the groups being statistically indistinguishable and, so to speak, equivalent: 1 and 2, 3 to 9, and 10. The result for the red wines is given above in parenthesis. There were no significant changes, but at least it improves the "French honor" a bit, as Château Montrose is also at the top. In four cases the difference is only one place, in four cases the place number is even identical. Another very important aspect is the comparison between France (Europe) and California. In California there is usually a balanced one climate before, so that the vines during the growth cycle are exposed to very similar conditions every year. Under the condition of the same vinification, the quality of the wines in the individual years is almost the same. In contrast, in Europe, especially in the colder wine regions such as France (including Germany and Austria) relatively large fluctuations, so that a "good vintage "Plays a much stronger role. One could now blame the "bad result" of French wines for bad vintages. However, it should be noted that three of the four reds came from 1970 and one from 1971. The "Conseil Interprofessionel du Vin de Bordeaux" ranks in 1970 among the "best four vintages of the last 45 years" and 1971 is called "very good". In addition, this was even investigated for the appellations from which the red wines originate: Pessac-Léognan. Pauillac. Saint-Estèphe and Saint-Julien, Again, similar statements were made over the two years. A "bad vintage" was thus an argument. This page was last modified at 15 April 2019 at 07:52.